"Sholay" , Most Popular movie of 70's for its action, for its dialogue, for his actors, for his actress, for his villains and for his songs . 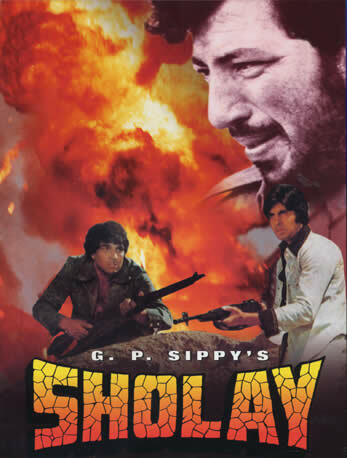 On 15 August "Sholay" will be release in its 3D version. Subhash Ghai convert this 2D movie to 3D. Dolby sound also used for this movie so that we can listen it easily. Shubash Ghai had buy the rights of this famous movie of 1975. Shubash Ghai will present Jay, Viru and Gabbar in his style. Ramesh Sippy was a doctor of Sholay besides being family. The grand kids were not born or involved in a ny aspect of the film Sholay and are just copyright inherotors by way of succession. Ramesh has succession rights that have more value than the grand kids hierarchically speaking. And additional stakes as director creatively speaking. Besides responsibility to all other minor shareholders whose faith in Ramesh Sippy might tilt the balance in his favor for treatment of the classic.